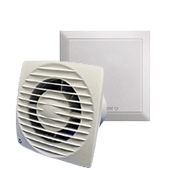 Duet is a range of run and standby fans designed to provide extraction levels that comply with Building regulations (Document F) for bathrooms and WC's and incorporates a run on timer. 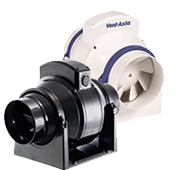 All models offer automatic changeover on fan failure.Ultra quiet and particularly suitable for areas where unobtrusive sound levels are essential, Duet is available for surface, recessed or duct mounting. IP44 rated. Duet meets the requirement of Health Technical Memorandum 2025, foul extract ventilation systems 2.8. 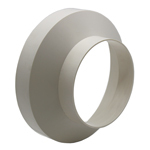 Ideal for new build and refurbishment installations. Duet features include a backdraught shutter, LED indicators showing the status of the unit, self diagnostic check of controls before the fan will start, run and standby facility, 5-25 minute run on timer and 24 hour auto fan changeover. 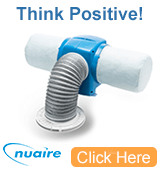 Suitable for ambient temperatures of up to +40°C, built-in dust filters. 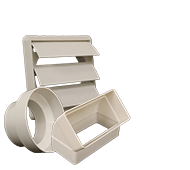 Duet is suitable for use with either 100mm diameter ducting or System 50 PVCu ducting, for installations that need concealed ducting, with a minimal ceiling void of only 90mm required. System 50 also combines the advantages of being non-corrodible and nonreverberant with easy installation. 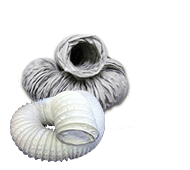 The housing and fan scroll are manufactured from high quality polymeric materials. The control circuitry is mounted within its own enclosure and the unit is rated IP44. Requires 100mm circular hole in wall. Fan 1/ Fan 2 running indicators, fault indicator. Sheet metal construction. Up to 2 inlets can be connected. 100mm discharge spigots. A remote indicator is included with this model. The remote fan indicator unit provides fan status information at a convenient position remote from the main unit. For use with Duet range. Hole size 115mm. For full details of system 50 components see the System 50 page. The fan performance should meet building regulations of 30 l/s suitable for bathrooms or utility rooms. Designed to meet Local Authority run and standby specifications. 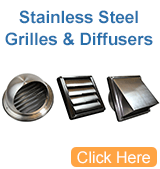 Complies with Building Regulation (Document F) requirements. Now with boost running facility. Self diagnostic check of controls. Overrun timer as standard, remote PIR's or humidistat can be installed. • Can be ceiling mounted. • Can be used with System 50 flat duct. • The Duet Duct model includes a remote indicator. • Duty sharing fans, automatic changeover. 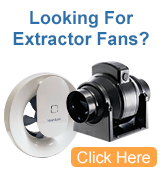 • Built-in or remote LED indicator for fan running and fan failure.